Wind causes lateral and uplift forces on houses that must be resisted by the appropriately designed and installed tie-downs and bracing detailed in AS 1684. Under normal circumstances, the house structure carries the gravity loads caused by the weight of the materials in the house itself and the loads applied by furniture and occupants. However, wind loads apply forces in different directions (lateral, over-turning and uplift) that can load a house in a completely different way. Unless elements and connections in the building have been designed and constructed with sufficient capacity to resist wind loads, significant damage may result. 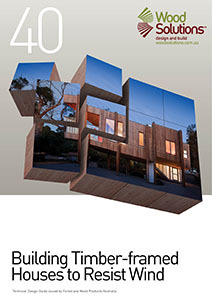 This Guide covers design and construction of tie-down and bracing systems for houses that use timber trusses or timber-framed roofs. It can be used for timber-framed walls or masonry walls and is suitable for cyclonic and non-cyclonic areas.